Summer is nearly finished - so we, the IT people, we’ll soon be able to hide our feeble bodies back in rhombus sweaters, where they are comfortable. Finally. As our clients come back from vacations with sour faces, we’re meeting them excitedly, with eyes lit up - now there’s someone to dedicate all our hard work to, and share misery with. To soften your reentrance into the dull working world, at least slightly, we’ve prepared a catchy read for you - an instruction on how to get the first fifty clients for online business. It’ll include some theoretical and practical advice and, hopefully, will inspire you to take action. 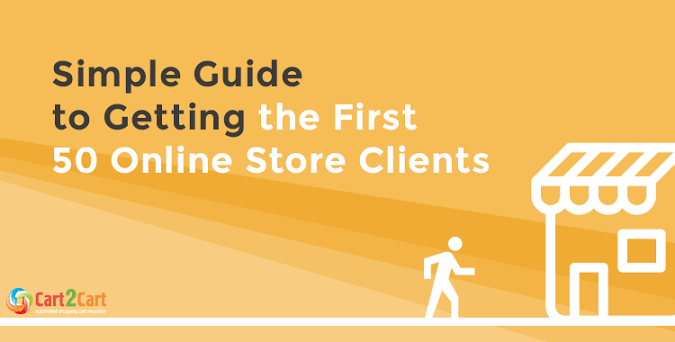 So, without further ado - here is the way to get the first 50 clients for your online store fast. Research. Each step you take in business should be thought out and headed in a clear direction, so you don’t end up stepping in s**t. Therefore, theoretical work up is the best place to start your selling path. At first, we recommend figuring out the future clients base - namely, establishing a customer’s persona. Once you get more customers, ask them directly about hobbies, blogs they read and so on. Keep updating and expanding their portrait as you go along, because the more you know about client’s needs, wants and interests, the more you’ll be able to satisfy them. From buyers to repetitive buyers and, then, true admirers of your brand - by building strong loyalty programs, giving out discounts, prizes, etc. Give extra. Having products to sell alone will get you nowhere. There are hundreds of competitors who offer same goods - why would a client choose you? The way to win them is providing something useful and additional for free. One helpful tool is written content - if you’re selling smartphones, for instance, post free, truthful reviews of them on your website, make comparisons and don’t be afraid to slam your own products a bit - that’s endearing. Also, free shipping is a must, and return policies that dispel clients’ anxiety about buying a disappointing product. These are just basics, so think of additional services you can provide, that’s appropriate for your target audience specifically. Reach out to influential people of your industry. It’s very common for fashion brands to give free stuff to celebrities, for award ceremonies, in promotion purposes. Use that tactic too - find people with huge internet following who are related to your niche, send them your goods (or simply pay them), and ask for a mention. That’s a good way to put your brand on a map and get first sales. Ask friends for help. We live in a Facebook era - most of us have tons of friends on social media - some close ones, acquaintances and pen-friends. Surely, some of them will be interested in your product, especially if it’s good. Afterwards, If they like it - ask them to recommend it to their social network’s people. Add your family and their friends to the equation and you’ll get a decent client base right away, without much marketing effort or investments. Sell on Amazon. Before your store reaches the crest of Google’s search list, why not sell stuff on the biggest online marketplace? The customers are there already - the astonishing number of them, so sweep them of their feet with your great product and prices. Give a huge discount for the first buyers to get the ball rolling - that will increase your purchase rate promptly. Collect reviews - use sites like Ilovetoreview - they provide a chance to give products at a low price or for free and get honest reviews in exchange. Guest posting. e-Commerce is not a place to be a lone wolf, no matter how romantic an idea it seems - you must have connections to succeed. So, don’t look at everyone as you competitor - find stores (blogs, etc.) you can exchange services with, for mutual benefit. Good example of such interaction is guest posting - you give meaningful content to someone’s website and receive traffic and access to their customers in exchange. Tied with the others, it’s a good mean to get your first customers. That’s it. These are the tips that’ll help you get your first 50 customers, hopefully. If you’ve got some personal advice on the matter too - we’ll gladly read it in the comment box. CartCart wishes you good luck!